Food stamps need to catch up to the digital age -- and quickly. On Thursday, the Department of Agriculture put out a call to action, asking companies to apply for an upcoming pilot program that would enable people to use food stamps for online grocery purchases. 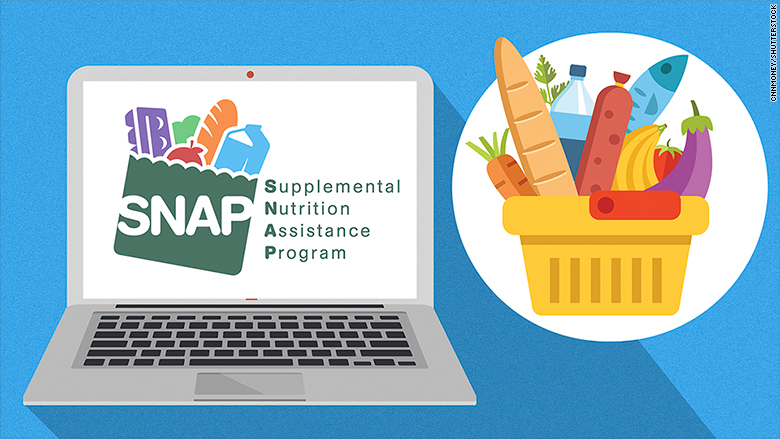 Approximately 45 million people used the Supplemental Nutritional Assistant Program (known as SNAP) in 2015. And yet there's currently no way to cash in on those benefits online. This pilot program is the first step. The Agricultural Act of 2014, or "Farm Bill," mandated that the USDA test a way for people to use food stamps online. Until today, the USDA has said it was laying the groundwork for a pilot, sorting out things like the security of online transactions. Now, the USDA is looking to partner with up to five retailers in three states for a two-year pilot program. The food stamps will not cover delivery or service fees for online purchases. The pilot is slated to launch next summer, but there aren't any hard dates yet. After two years, the program will be evaluated and potentially expanded. The news comes in the midst of growing calls for SNAP to modernize. On Monday, Senator Cory Booker and Reps. Tim Ryan and Barbara Lee sent a letter to Secretary of Agriculture Tom Vilsack, asking the Department of Agriculture to accelerate its efforts to digitize food stamps. "It would help us move toward a hunger-free and more nutritious America," they wrote. "Unfortunately, many of our governmental policies and programs have not kept pace with the dramatic improvement in healthy food access that technology offers." Food startup Thrive Market, which sells affordable healthy and organic goods online, launched a petition in late June that asked the USDA to let people use food stamps online. It has garnered more than 310,000 signatures. On Monday, meal kit delivery service Blue Apron joined Thrive Market and other brands like Clif, Kiss My Face, Garden of Life and Soylent in the petition. "We have an opportunity to be putting pressure on making sure that food stamps are a 21st century program," Gunnar Lovelace, cofounder of Thrive Market, told CNNMoney. "We haven't run the campaign to make the USDA look bad, our goal is to be long-term partners in innovating." It was not immediately clear whether companies like Thrive Market would be considered for the pilot program. The move could certainly boost business for ecommerce grocery companies -- but Thrive Market said it's not the primary reason it wants to see SNAP evolve. Democratizing access to healthy food is something that hits home for Lovelace, who grew up in a single parent household and said there were months that his family lived off of rice. Thrive Market -- which has raised $141 million since launching in November 2014 -- already has a social impact portion of its business called "Thrive Gives." For every paid subscription (which typically costs $60 per year), the company gives one a free subscription to a low-income family so they can purchase affordable healthy and organic food. Thrive Market said it has given away more than 350,000 memberships to date.